As the heavens open their dialogue for the New Year of 2018, there is a noted lunar theme in the air! In this first blog of 2018, we are highlighting the Super Blood Moon on Jan 31st. This is part of a series of Super Moons wrapping up 2017 and starting 2018. A Super-Moon occurs when the Moon reaches peak fullness during its closest approach to Earth. Super-Moons appear up to 14% larger and 30% brighter than normal. Super-Moons can occur multiple times per year, as we are seeing with the current Super-Moon Triad. The Dec. 3rd Super-Moon in Virgo was the only one in 2017, but 2018 opens with another in Taurus on New Year’s Day! This 2nd Super-Moon sets the stage for the third Super-Moon of this series, which is not only a Super-Moon, but as the 2nd Full Moon in January 2018, it qualifies as a Blue Moon, an event occurring every 2.5 years, in this special case, a Super Blue Moon. With two Super-Moons in January, on the 1st and 31st, the final lunar sign in this Super-Moon series pulls a trifecta, also being a Total Lunar Eclipse. Thus we have a rare Super-Blue-Blood Moon. A notable recent Super-Blood Moon happened back in Sept. 2015 as the sky burst with heavenly signs. The 2014-2015 Blood Moon Tetrad capped off with the first known Super Blood Moon on a Hebrew feast. The Blood Moon Tetrad wrapped up with the Super Blood Moon on Tabernacles Feast, Sept. 28, 2015. The history of Blood Moon Tetrads teaches we could expect efforts to persecute Israel along with the Christian Church, while maintaining expectations that the Almighty always protects His people. The modern Blood Moon Tetrads have been significant in marking the restoration of Israel, as a sovereign nation, with its reclamation of Jerusalem. The next logical step observers are on the look out for relates to the restoration of the Temple of Israel and its daily sacrifices. Preparation along these lines has been active in Israel for a number of years, but we may expect some developments in this area along political fronts continuing, with President Trump’s recent announcement of the planned move of the US Embassy from Tel-Aviv to Jerusalem, as part of a historic recognition of Jerusalem as the capital of Israel. Figure 1. Super Blood Moon on Sept. 28th was visible from Jerusalem. 110:1 The Lord said to my Lord, “Sit at My right hand, Till I make Your enemies Your footstool.” 2 The Lord shall send the rod of Your strength out of Zion. Rule in the midst of Your enemies! Thus we can see how the current Super-Moon Triad summarized by the Super-Blue-Blood Moon opening 2018, is linked to the 2014-2015 Blood Moon Tetrad. 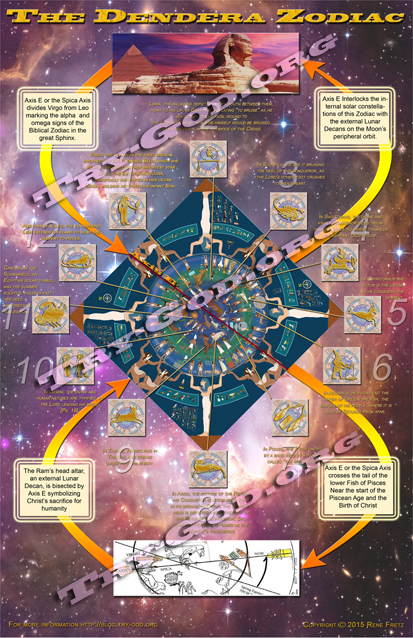 The spiritual impact of these luni-solar heavenly signs will not be realized individually as much as collectively. Also the fact that the culmination of the Blood Moon Tetrad in 2015 exhibited a series of signs leading to the Rev. 12 sign on 9/23/2017, is a major key to keep in mind. As the Figure 1 chart tells us, exactly 2 years prior to the 9/23/2017 Rev. 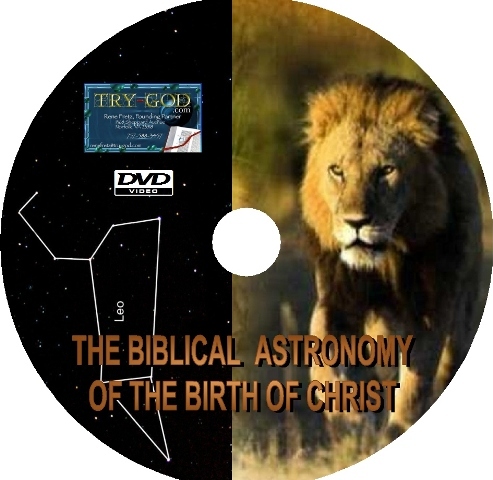 12 sign, the 50 year Jubilee fell on the Day of Atonement on the Hebrew calendar. As we pay attention to the celestial context of the heavenly signs surrounding the Blood Moon Tetrad, we will gain a fuller understanding of their significance. October 28th, 2015 [Jupiter-Venus, Mars unite in a 1 degree triangular massing] in 2016. We can see from this list that the sky was thick with heavenly signs leading up to and including the Final Super Blood Moon of the 2014-2015 Blood Moon Tetrad. As there were 3 Jupiter-Venus Conjunctions marking the birth of Christ in 3-2 BC, so this triple union of Jupiter-Venus aligned with Regulus in Leo, reflects a similar spiritual light in 2015. In fact the Rev. 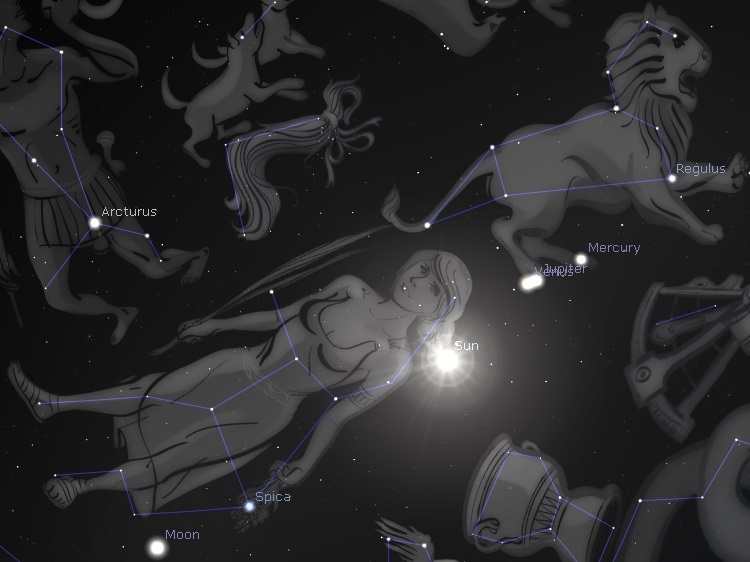 12 heavenly sign: the [Sun clothing Virgo with the Crescent Moon at her feet] on September 17th, 2015 is announced by Mercury-Gabriel located just outside the womb area of Virgo above Spica/Al Zimach, 2 years ahead of the replay of the Great Wonder in Heaven, on Sept. 23rd 2017! This shows us how the planetary movements surrounding the both the birth of Christ in 3-2 BC, and the heavenly signs of the Blood Moon Tetrad leading to the signs of 2017 mirror each other. The Jan. 31st, 2018 Blood Moon will also be visible in Israel as the moon is rising. It is the first of 3 consecutive Blood Moons visible in Israel. The 2nd occurs on July 27/28, 2018 and the 3rd on Jan. 20-21, 2019. This Blood Moon lunar triple of 2018-2019 follows 7 years after the lunar triple of 2010-2011 Blood Moons also visible in Israel. As we can see below, these two sets of Blood Moon Lunar triples framed the 2014-2015 Blood Moon Tetrad, marking Hebrew Feast and holy days in 2014-15. The Chart below also shows us layers of Total Solar Eclipses, for instance the solar eclipse located outside each lunar triple. The 2014-2015 Blood Moon Tetrad was centered between the saddest days on the Hebrew Calendar, the days of Av marked by two lunar triples framing this Tetrad between 2010-11 and 2018-19. These Lunar triples or triads are Blood Moon lunar eclipses that do not fall on Hebrew Feast or holy days, bracketing the Blood Moon Tetrad that did. Also the 2nd Blood Moon of each lunar triple was visible over Jerusalem. These lunar triples recall the Jerusalem Temple being destroyed on two key occasions in their history, in the Hebrew Sabbath years of 586-587 BC and 69-70 AD. This Jubilee calendar also marks 27-28 AD as a Jubilee year, denoting the year Jesus opens his ministry to Israel, as seen in [Isa. 61:1ff & Lk. 4:18-19]. Further observations linking the Total Solar Eclipse of Aug. 21st 2017 to the Blood Moon Tetrad of 2014-2015, and the eclipses of 2016 is found in the fact that each Lunar triple framing this Tetrad is itself framed by a series of Total Solar eclipses! This Total Solar Eclipse series is related to the “Days of Av” as a set of 4 Total Solar Eclipses, all taking place on the 1st of Av. The first bracket framing the Lunar triple is actually the 3rd total solar eclipse in a set of 3 total solar eclipses on the 1st of Av, as seen in Figure 1. As we have documented in previous blog posts on June 24th and August of 2017, the Aug. 21st Total Solar Eclipse initiated the 40-day Season of Repentance leading to Yom Kippur 2017. However, when viewed in the celestial framework of this series of Total Solar Eclipses bracketing the 2014-2015 Blood Moon Tetrad, we are provided a clear picture of the relationship between these solar eclipses and the Blood Moon Tetrad. 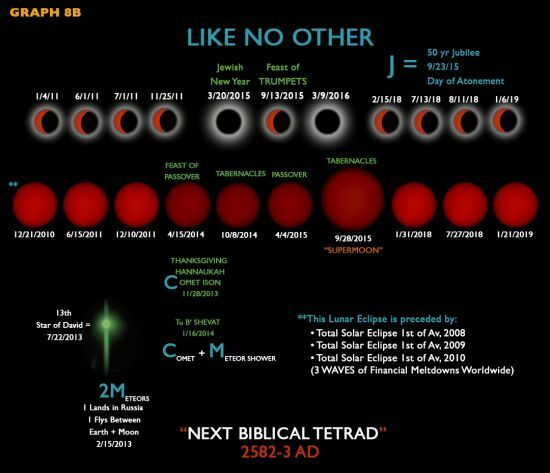 The Chart below reflects both series of Partial and Total Solar Eclipses framing the Blood Moon Tetrad of 2014-2015. The woman has a crown of twelve stars, and Jupiter and Venus are in such close conjunction they appear to merge into one star just as they did in 2 BC, except this time in the lower rear paw of Leo. The Sun is clothing Virgo with the Moon near her feet. The King Planet Jupiter and Venus are also aligned with Mercury-Gabriel and the King Star Regulus in Leo. What is extraordinary with this version of the Rev. 12 Sign is that it takes place in the center of the Blood Moon Tetrad that marks the destruction of the Jerusalem Temple in 70 AD. As we transition to events of the recent past, in past light of Jupiter’s role in the Celestial Prelude, the 2017 triple conjunction of Jupiter-Spica was heralded by two Mercury-Spica unions in 2015, within a 6-week period. The first conjunction occurred Sept. 17th, 2015, and the 2nd on October 29th, 2015. Mercury-Gabriel, as messenger arch-angel gives two proclamations resulting from its retrograde motion, as a precursor to Jupiter’s retrograde motion in Virgo, forming a triple union of Jupiter-Spica in 2017. Mercury-Gabriel established the pending triple union of Jupiter-Spica on Oct. 11th, 2016, in a pre-dawn conjunction with Jupiter, as Mercury passes within a degree of Jupiter in a Sunrise union. Once the recognition of ripe Barley occurred in Israel it, added two more Lunar Eclipse events in 2016, to the Blood Moon Tetrad of 2014-2015. Although the two added Lunar Eclipses on Hebrew Feast and Holy Days with the four Blood Moons do make a highly unique event including 6 Lunar Eclipses from 2014-2016, the added 2016 events do not qualify as Blood Moons. That being said, it does not make these 2016 Lunar Eclipses any less significant, or less worthy of our undivided attention, because all 6 of these qualify as Lunar Eclipses in 3 consecutive years on Hebrew Feast days, just a bit different, in a distinct class from the Four Blood Moons! As we consider the import of these Penumbral Lunar Eclipses in 2016, we can not omit the similarity to the Penumbral Lunar Eclipses that happened in 70 AD marking the Romans destruction of the Jerusalem Temple. The following summary from our Biblical Blood Moon Calendar post, shows the 70 AD Roman Temple Destruction as Jesus Prophesied. Its interesting to note that if the ripe Barley determination was made before the Total Solar Eclipse on March 9th, 2016, it would also have aligned with Nisan 1, as seen with the Total Solar Eclipse above on 3/30/70 AD. This comparison of Solar and Lunar signs between 70 AD and 2016 is truly remarkable! Also, as we mentioned in the Purim Blood Moon post, 71 AD was the last Lunar Eclipse on Purim that we can find in the intervening period up to today. The fascinating parallel here is that these Luni-Solar signs marked the destruction of the Jerusalem Temple in 70 AD, while today we are looking for the return of a Third Jerusalem Temple as the next logical step in Biblical Prophecy following up on Israel’s reclamation of Jerusalem, marked by the 1967-68′ Blood Moon Tetrad, in the 6-day War with Egypt. Thus we see the impact of these Solar and Penumbral Lunar Eclipses in 2016 as they form the only other Luni–Solar signs on Hebrew Feasts that are considered a Tetrad over the last 2000 years! In summary, we have seen how the Super-Moon Triad capped off with the 1st Blood Moon of 2018, links to the Blood Moon Tetrad of 2014-15, via the series luni-solar eclipses that frame it. The Lunar Triads bracketing the Biblical Tetrad visible over Jerusalem, link to the Temple which was destroyed in the Sabbath years of 587-586 BC and 70 AD, looking forward to the future 3rd Jerusalem Temple. This is established by the luni-solar eclipses matching in 2016 and 70 AD, both leading to the Rev. 12 signs tied to Christ through the Jupiter-Regulus unions in 69 AD & 3-2 BC, along with other planetary conjunctions noted above. This suggests we should expect activity related to the forthcoming Third Jerusalem Temple.